I am two days into our Best of Europe in 21 Days tour. I have 27 wonderful tour members and I'm assisted by two of our top guides, Ben Cameron and Trish Feaster. It's been many years since I dedicated 21 days to one busload of travelers, and this promises to be a learning and growing and brainstorming experience for Rick Steves Europe Tours. 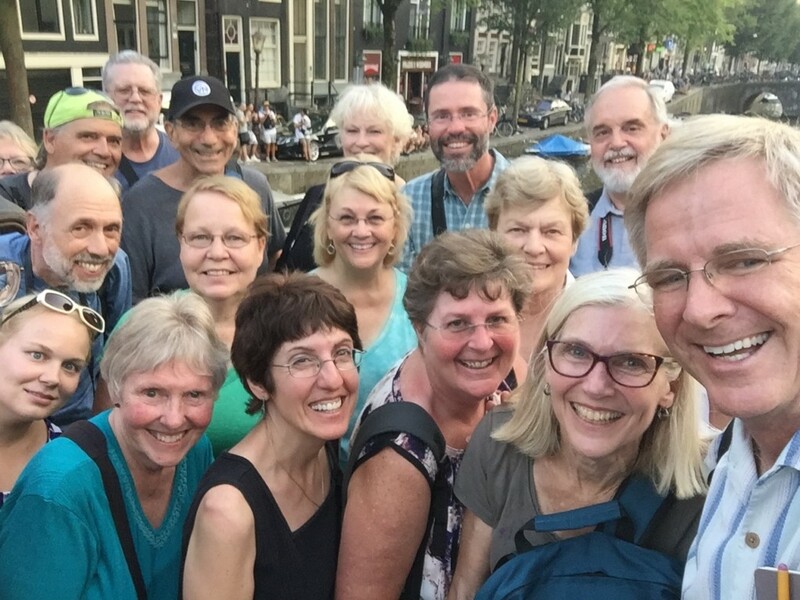 We take over 20,000 travelers to Europe every year on about 900 bus tours (roughly 40 different itineraries), and with 150 talented guides, we need to be sure we are all teaching and guiding the "Rick Steves way." And I need to know about the guides' on-the-road, day-to-day reality (new technology, higher expectations, more dietary concerns, and so on). So each day Ben, Trish, and I are experimenting, huddling, and debating to make sure we're giving our tour members the best possible value. Just today it occurred to me that if we're doing our job, we'll be extremely busy behind the scenes ensuring that our travelers can have the maximum experience but without feeling harried. It's amazing how much more a smartly guided tour accomplishes in a day than a typical solo traveler might. Here's a behind-the-scenes example of the schedule we came up with for the first day and a half of our Rick Steves Best of Europe in 21 Days tour (with a sampling of guiding notes from our work). We go fast (as it's a "best of" tour), but you'd be surprised how smooth it can be for those on the receiving end when the guide is doing his or her job well. Day One: Meet group in Haarlem, orientation meeting and get to know Haarlem (half an hour from Amsterdam). 2:00 Intro meeting (guide lays out groundwork of our tour). 4:00 Haarlem town walk with Ruby (a local guide), including a climb through a classic windmill and a local snack canalside (freshly fried bitterballen, be sure to have Ruby take 15 minutes at the end of her guided walk for general "reflections on Dutch lifestyles" questions). 6:30 Indonesian rijsttafel dinner (a traditional feast from the Dutch colony known as the "Spice Islands," with a table full of dishes, guide explains four kinds of local beer -- rounding price up and down to €3 to make ordering smarter and faster). 8:15 Take those interested to the pipe organ concert in Haarlem big church (free, one of Europe's grandest pipe organs, Mozart performed on it, great experience, start by gathering people in rear of church: give people permission to leave early if too jet-laggy, read organ description from Amsterdam book, explain how this church is a fine example of a former Catholic church made Protestant). 8:32 Catch train (give round-trip train tickets and all-day Amsterdam tram pass, give public-transit lesson). 9:00 Arrive Amsterdam, orient group in front of station, hop on tram, get off at Anne Frank House (tram driver will announce it in English). 9:15 Historic Amsterdam and Jordaan guided walk (theme: Anne Frank intro, tolerance), gay rights monument, men can actually demonstrate outdoor urinal, wander through scenic Jordaan district, stop at "big head square" for 20-minute coffee/WC break, give sampling of three kinds of local cheese when group meets up again (pick up cheese at Reypenaer cheese shop on corner while group is having break), walk to Dam Square, up Kalverstraat, pop into Begijnhof. 10:45 Catch tram at Spui for Resistance Museum (tram drops you right at theater). 1:30 Catch tram to Rijksmuseum. 2:00 Meet guide at Rijksmuseum for 90-minute tour of Golden Age Dutch art (Hals, Vermeer, Rembrandt, and company). One hour of free time for more art, coffee, or wander in park. 4:30 Meet at the IAmsterdam monument in the park, walk to canal-boat dock. 4:45 One hour canal-boat ride through city (captain will make a special stop to let our group de-boat just outside the Red Light District, near the Waag). 5:45 Take group on guided walk through the salty sailors' quarters/Red Light District, Zeedijk, and back to the train station. (Topics for guide to cover: city organization, prep for wild zone), warn about pickpockets and danger of photographing prostitutes -- wide shots from bridge are fine, misc. cultural insights, stop on bridges and gather people very tight for talking interludes, first bridge intro to prostitution, second bridge for more social issues/prostitution -- let people walk around the block, meet back on bridge for all to sample fries Dutch-style with mayo, continue walk -- stop in front of hidden church (Our Lord in the Attic), ask where it is (then show photo of interior on wall), walk to next bridge to talk about Dutch pragmatic drug policy (permit marijuana in coffee shops and how they solved their big hard-drug problem in this neighborhood, a "no-go zone of hard-core addicts nicknamed "Heroin Ally" back in the 1970s, talk of sailors' quarter heritage, and show original dike and locks). Walk on out via Zeedijk and to station finishing in front of station where the morning began. 7:30 Train back to Haarlem (they depart about every 10 minutes). 8:00 Review evening options and next day with group in front of Haarlem station, free for dinner. Two days down, 19 to go. I hope you can follow me on my blog and on Facebook as I guide our gang of hearty travelers on our Rick Steves Best of Europe tour. I'll be sharing our experiences and some candid, behind the scenes peeks at my work daily for the next three weeks. Happy travels!